Meccano Limited started manufacturing Hornby Trains in 1920. 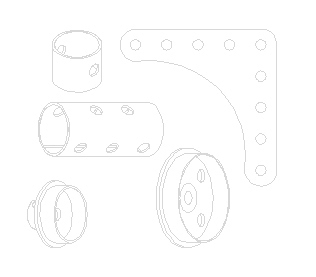 New Meccano parts were introduced to the Meccano range which indicated a convergence of these products. However all these parts were discontinued during World War II, in 1940. This and the next two pages show some of the cross over products that Meccano made. Note with all these signal arms the reverse side was white with a black chevron. Part 173 (original numbering) male and female rail adaptors. These could be used for coupling Hornby track to Meccano strips. 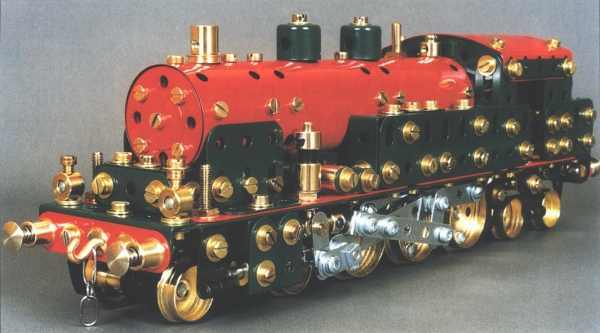 A fine model of a 4-6-4 Tank Locomotive built to 0 scale by Bernard Périer. Building instructions for this fine model can be found on page 46 of the September 2001 edition of Constructor Quarterly. Subscriptions and individual editions, are available from Robin Johnson, 17 Ryegate Road, Crosspool, Sheffield S10 5FA, United Kingdom. If you did not hear any sounds after this page loaded, click on the icon to the right to hear a train passing.